ZURICH, Switzerland - Broadcasting since August 2010 on Swiss television (SF) and radio (SR DRS), Zambo is a multimedia world for children, aged between seven and 13, in German-speaking Switzerland. In the programme viewers are taken on a trimedial discovery trip – via television, radio and online. With the creation of the Studio 30 on the Brunnenhofstrasse in Zurich, the technical pioneers of Swiss Radio and Television (SRF) now have an infrastructure that is unparalleled — with a Studer OnAir 3000 mixing console at its core. Situated in the old building of a large complex of radio studios, the technical requirements of the installation provided an almost insurmountable challenge for even the most accomplished specialists — since Zambo is broadcast both on SF2 and DRS 1 — as well as the Internet! For installation project manager Thomas Wochner from broadcast service provider TPC, this ‘trimedial’ task meant that new technology would be required in abundance, with the ability to combine workflows for production, studio direction and editing purposes. Not least because of the high requirements for automation and user ergonomics TPC chose a Studer OnAir 3000 mixing system for use in both studio and control room. The central SCore drives 42 faders — 24 for camera direction and 18 in the self-op studio. In addition to the SCore engine, there are two further sets of Studer I/O Frames, one in the central engine room and the other one in a local studio rack. 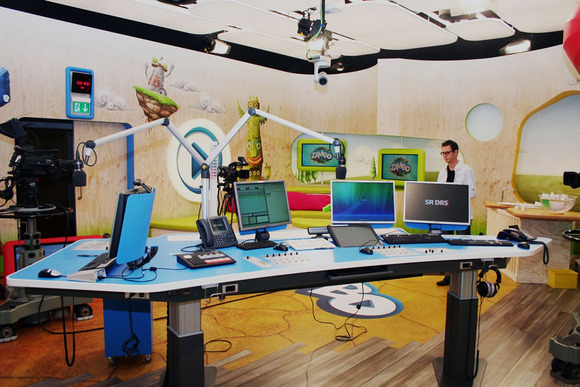 The Studer Call Management System (CMS) and a DigaSystem Broadcast system have been carefully integrated; for call-ins and telephony infrastructure the Zambo studio infrastructure is networked to the central CMS at Brunnenhofstrasse, which is hub for all SRF’s radio programmes. All equipment was supplied by Dr.W.A.Günther Audio Systems AG, the territorial Harman Professional distributor.